Sit back and relax in shaded luxury underneath this upscale Brynn Gazebo. Not only does this structure keep out the bugs and protect you from the sun's harmful rays, it's also the perfect unit for outdoor dining, parties, or simply relaxing in the backyard. Relax under this versatile Coronado gazebo from Hampton Bay. Made with durable aluminum and steel construction with a dark gray finish, the complementary dark gray canopy is louvered for star gazing or easily closes for privacy and shade. Add a touch of personal flair with climber plants or vines to create a decorative, shaded passageway over a walkway or in your backyard that you will enjoy for years on end. Brynn 12 1/2 ft. x 12 1/2 ft. Gazebo with Vented Canopy Sit back and relax in shaded luxury underneath this upscale Brynn Gazebo. Not only does this structure keep out the bugs and protect you from the sun's harmful rays, it's also the perfect unit for outdoor dining, parties, or simply relaxing in the backyard. 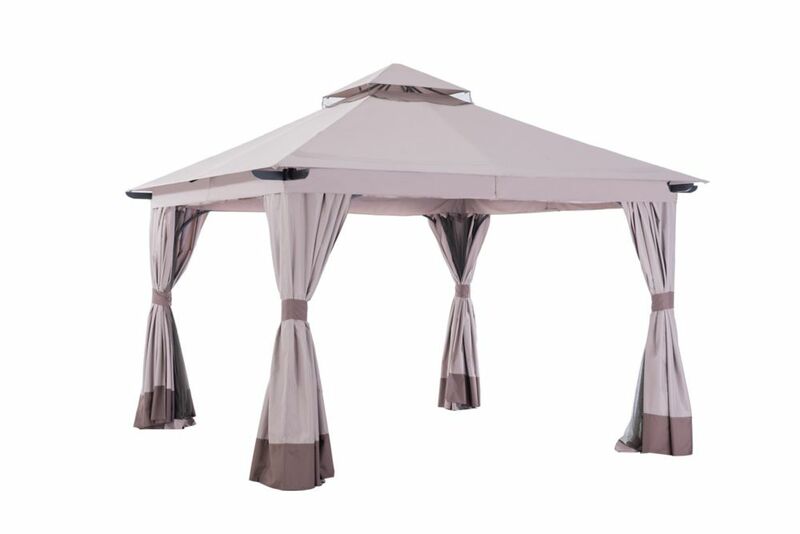 Brynn 12 1/2 ft. x 12 1/2 ft. Gazebo with Vented Canopy is rated 3.8 out of 5 by 23. Rated 4 out of 5 by Michael from Overall, I am very happy with this canopy. Installation is... Overall, I am very happy with this canopy. Installation is a two person job. My wife and I assembled this in a few hours over two days. The instructions are a little vague at times. But it’s managable. I also waterproofed the roof and used wedge anchors to secure it to my concrete patio. Rated 3 out of 5 by CGL from We bought this gazebo for its size as it large and square. There were a few damaged parts but I w... We bought this gazebo for its size as it large and square. There were a few damaged parts but I was still able to use them until such time as new ones can be sent to me. Unfortunately, putting it together was a challenge, especially when it came to hanging the screening and curtains. The directions for a number of the final elements isn't diagrammed or referenced in the directions. When you consider that there were extensive diagrams for creating this item, why aren't those engineering documents used for the end user directions. It would be great if Home Depot would demand vendors provide high quality assembly instructions given they are a DIY type of store. Rated 5 out of 5 by Michael from Just purchased this so it's been only a week but... Just purchased this so it's been only a week but we are very happy with it. It was easy to put together but you are going to need the help of at least 1 other person and at least an 8 or 10 foot step ladder. The instructions are not always easy to read so look at each insert carefully. Rated 1 out of 5 by JoeKelly from This gazebo look lovely when it is new and I appreciated the mosquito netting. Sadly the fabric p... This gazebo look lovely when it is new and I appreciated the mosquito netting. Sadly the fabric perishes. It lasted the first summer, here in New England. We remove it in fall and reinstall for the summer. By the end of the second summer it has faded and torn and is not useable. I don't consider this a throw away item. Too expensive to buy a new one every 2 years. I would buy a replacement cover, but it sounds as though they are hard to get hold of. Does this gazebo come with the sides and the netting? Hi there, This unit comes with the wall and the netting.